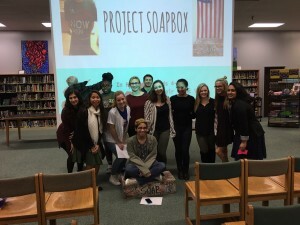 Project Soapbox occurred at our own Waubonsie Valley during lunch periods in the library on November 3. Participation was allowed by any student, but it was particularly targeted towards government students. The actual soapbox comes from the phrase “standing on your soapbox” when political speakers would elevate themselves by standing on a wooden crate to voice their opinion. Waubonsie Valley students were able to stand on Mr. Wolak’s actual wooden soapbox and voice their opinions on issues they are passionate about. They delivered a two minute speech addressing and bringing awareness to the topic. Many students made a speech from various government classes ranging from topics like greater research for cardiac health problems, stopping ignorance, or Common Core issues. Top speeches advance to Aurora Citywide Project Soapbox Competition competing against students from Metea Valley, Neuqua Valley, Oswego, and more. The students at this competition will be addressing the issue “Tell the next president about an issue that affects your community.” Many Waubonsie Valley students will participate Thursday during school and have the ability to discuss their passion.